My husband and I moved to the very isolated farmhouse in Swindale in 1976 (see right). Swindale is a valley between Shap and Haweswater with only three habitable houses, Swindale Head being the last and highest one at a height of nearly 1000 feet. It is a glaciated valley with many distinctive features such as drumlins, hanging valley, glacial erratics and a dry lake bed and several fine waterfalls at the valley head. The house itself dates from the early 17th century and there is no electricity supply or modern amenities so life there was not easy. 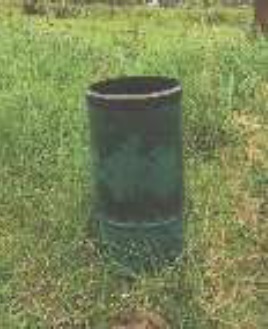 I started taking unofficial records of rainfall in the 1980s with a cheap plastic cylinder attached to a stake and kept the data in inches. There was also a wind vane but that did not last long as the wind was too strong and it quickly broke. I kept the records in little note books along with notes on wind direction – before the vane broke- and temperature each day but it was all very amateur. As we had no electricity we tried various kinds of generators, none very successful until we met a local vicar who was also a keen amateur electrician. He set up a water wheel in the stream nearby, and along with low voltage light bulbs that originally came from buses, we had a lighting system of sorts. Incidentally, the water wheel was a real Heath Robinson affair made from a Flymo cutting blade and many soup ladles but it did work after a fashion except when the pipe got filled with stones or fish got trapped in there. We also relied on Tilley lamps and old fashioned paraffin lamps. Eventually our friend devised a better water scheme that meant taking water from higher up the stream through a larger pipe and this involved obtaining permission from the Environment Agency. During the discussions with the EA man I happened to mention that I was keeping rainfall records and he asked me if I would be interested in becoming an official rainfall recorder as they were looking to increase the number of recorders in the area. I agreed and the gauge was installed in the field at the bottom of our property. The gauge consisted of a copper cylinder that was sunk into the ground in a 1 metre square of gravel. Inside there was a little copper bucket to catch overflow water, a bottle to catch the regular rainfall and a funnel at the top to direct it to the container. The bottle was emptied every day at 9am (10am in the summer) as it would not have been possible to do it at Midnight, and the rainfall was measured in a measuring cylinder that was calibrated to match the diameter of the gauge. I did this collecting of rainfall for over 20 years until I had to leave Swindale in 2013. After I had read the amount of rainfall in the gauge I recorded it on a card which was posted at the end of the month to the EA and I also wrote the figures and a brief comment on the weather in a small blue diary which was provided by the agency so I now have a record of the weather for almost every day since 1990. It was ‘almost every day’ because we did occasionally go away and when that was the case the gauge was read when we returned and the amount put down for the whole missing period. The monthly totals were accurate though. When there was snow it was a bit more tricky as the snow that had accumulated in the funnel had to be carefully scraped out into a jug and gently warmed until it melted and the resulting water could be measured in the cylinder as normal. This was obviously not as accurate a measurement. Once when there was a large amount of snow in the field the gauge was completely invisible in a drift and we had to guess its position and dig it out. I’m sure that the measurement that day was certainly not very accurate. It is very interesting to reread all the diaries now as it is generally not easy to remember exactly what the weather was at any particular time unless it related to particular events and I have found that people have false perceptions of what it was like. I can say, and have proof in my records, that there was much more snow and frost in the winter when I began in the 1990s than there was in the next decade and there was often snow in March and even April. I noticed that the likeliest time for snow was the beginning of February (we often had difficulties getting out of Swindale for family celebrations then because of snow) although we did also have difficulties when going away for Christmas. The wettest year was 2008 with a total of 2847.9 mm with every month except April and May having over 100mm and it was quite closely followed by 2009 with 2807.6mm. The dryest was 1996 with only 1594.7mm. The average for the whole period was 2245.0mm so 1996 was noticeably dry. I think that it was one of the years when the nearby Haweswater reservoir was extremely low. Other statistics that may be of interest:- the largest daily total was 105.8mm on September 28th 1996 – recorded as ‘very windy, heavy rain pm onwards’ in my diary.The whole of the rest of the month was very dry with the monthly total being only 159.5mm so this heavy rain was certainly extraordinary. (I wasn’t still in Swindale last December when Storm Desmond struck so I have no records for then, unfortunately, although the gauge is still there. )The largest monthly total was for November 2009 when 667mm fell. Although every month varied quite widely there was a general pattern to the rainfall with the largest amounts in the winter months at the beginning of the year decreasing towards the middle of the year and then increasing again towards November and December. There were some very wet summers though and some dry winters so it was never predictable. When there was a very dry May in 1991 (only 8.4mm for the whole month) it was followed by a wet June and in 2009 February was the driest month but July and August were both very wet. The joys of weather rather than a climate! It was a fascinating thing to have done, although it was sometimes a chore to have to trudge down the garden, often in the rain, to collect the precipitation and I am glad that I was able to do it for so long.